Pool pumps are the heart of any pool and if they aren't working properly the rest of the pool system can fail. They are responsible for ensuring your pool is healthy every day. If your pump is failing, increasingly noisy to operate or you just need more power this article can help. There is a lot to know and learn when it comes to pool pumps so if you are in the market for a new pump or just want to learn more you've come to the right place. If you have tried to navigate through all the different kinds of pumps on the market you probably felt confused at one time or another. It can be really frustrating shopping for a pump especially if you don't know what kind you need or the difference between dual and variable speed. We are going to start with going over the basic parts of a pump and how they work followed by our list of top rated pool pumps on the market today. At the end of the day it's definitely not rocket science and your final decision will be a lot easier once you learn the basics. We are confident that you will be able to find a quiet, efficient, versatile pump that is perfect for your pool at a price you can afford. Whether you are operating a complex solar heater, an elaborate water feature or a hot tub year round there is a pump that is designed just for your unique needs. A pump has one job and that is to pull water out of your pool and then put it back in. This circulation process allows important functions to occur that keep your pool clean and safe to swim in all season long. In addition to pulling water through the filter, circulation is necessary to heat the water and if you have a salt water pool it allows chlorine to be produced in the chlorine generator. Adding chemicals just wouldn't have the desired affect if they weren't being mixed by the circulation process. A pool pump is pretty basic if you break down the parts that make it up. The motor is where it all starts and is what controls the speed and power that goes into turning the impeller blade. The resulting Horsepower or HP is important when it comes to sizing your pump properly for your specific pool. 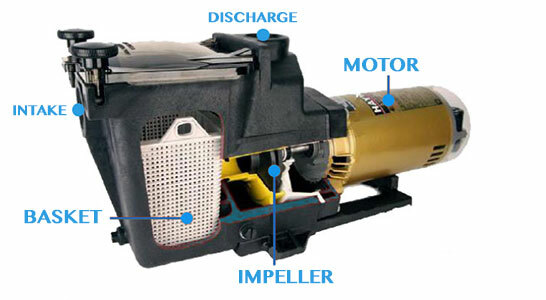 The impeller creates a constant flow of water that enters through the intake port and exits through the discharge port. The basket traps large debris as water flows through it and needs to be emptied as needed. 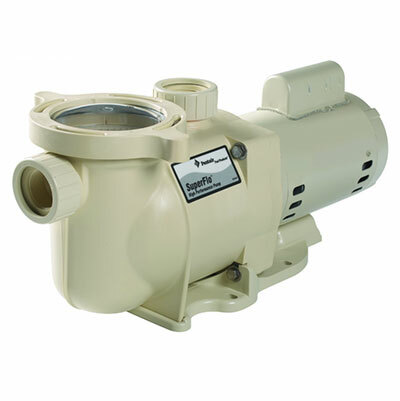 There are 3 main types of pool pumps; single, dual and variable speed. The basic single speed pump has been around for years and relied on by millions of pool owners around the world. The dual speed pump was introduced and gained traction because it could run at a normal speed and a reduced speed for energy conservation. In recent years the variable speed pool pump has emerged as the best choice for almost all pool owners because it can run at multiple speeds. A single speed pool pump operates at one constant speed. The speed is determined by the horsepower of the motor which is commonly between .75 - 2.0 HP. If you are in the market for a new single speed pump it's imperative that you size the pump properly for your pool, erring on the side of being oversized. If you find that your single speed pump doesn't have enough horsepower or too much, you will need to replace it with a dual or variable speed pump or add a pool booster pump. The main advantage to purchasing a single speed pool pump is the low up front cost. Single speed pumps also tend to last longer on average most likely due to their simple design that's been perfected for many years. They can cost a lot more to operate compared to variable speed pumps and the power limitations can be problematic. A dual speed pool pump is very similar to a single speed pump except as the name implies it has 2 distinct speeds that it can operate at. The low speed is ideal for improved energy efficiency, routine circulation and chlorine production if you own a salt water pool. The high speed setting with up to 3.0 horsepower is ideal for operating water features, hot tubs and cleaners when sized properly. A dual speed pump has mid-range efficiency that's better than a single speed but doesn't quite compare to variable speed motor technology. The price is also middle of the pack but you get what you pay for in a pump that is versatile with 2 speed options. A dual speed pool pump has 2 speeds while a variable speed pool pump operates at multiple speeds on a sliding scale. A variable speed pool pump is without a doubt the smartest option when considering a new pool pump. The top rated variable speed pool pumps on the market today boast energy savings up to 90% over single speed pumps. The numerous speed options allow you to completely customize circulation and chlorine production if you own a salt water pool. The incredibly quiet magnet motor is the same technology used in electric cars! In addition to saving money every year in energy costs you will have complete control over your pool especially if you use a pool automation system. If you are replacing an old pump you may also be required by law to install an energy efficient variable speed pump. Variable speed swimming pool pumps have multiples speeds and 90% more energy efficient than single speed pumps. They are the quietest pool pumps you can buy and even have government rebates because of their energy efficiency. Purchase rebates may be available from select pool pump manufacturers and local or federal government energy suppliers. Always check manufacturer and government websites for the latest rebates for energy efficient variable speed pool pumps that can exceed $100. For more information on how to save energy operating your pool visit Energy.Gov @ Installing and Operating an Efficient Swimming Pool Pump. When purchasing a new pool pump you will need to do a bit of work before getting started. If you are buying a pump for a new pool you will need to work through the steps for sizing a pool which includes things like water volume, pool features and the total dynamic head or TDH. If you are buying a replacement pool pump your research should be a bit easier assuming that your previous pump was sized properly. The horse power of the pump is important. A pump is rated by the maximum horsepower it can produce and it won't exceed that amount. You need to make sure that you won't ever need more horsepower than your pump is rated for unless you want to adda booster pump. If you are buying a single speed pump you need to get it right, and if you are buying a dual or variable speed pump you have a bit more wiggle room. If you want to make sure that your pump has enough horsepower to keep your pool running smoothly you need to size your pool pump based on variables like water volume, pool features and piping. You'll need to determine the flow rate and take a look at turnover rate for your unique pool. Pool pump electrical requirements vary with different pumps. Pumps are rated for either 115 volts or 230 volts and it's important to know this before installing the pump. A pump that is receiving an improper electrical current can overheat and cause irreversible damage. Always refer to the pump manufacturer's installation manual for complete instructions and hire an electrical professional for any electrical installations. There are two types of mounts for pumps, side mount and top mount which refer to where the intake and release ports are located. This is important if you have space limitations but also should correspond to where the ports are on your pool filter. Typically a sand filter will require a top mount whereas a D.E. and cartridge filter are side mounted. There may be exceptions to this so always double check before purchasing a pool pump. The top rated pool pumps have everything you could ever want in a pump including excellent customer service and multi-year warranties. Every pool pump on this list is endorsed by the most important people, satisfied customers. 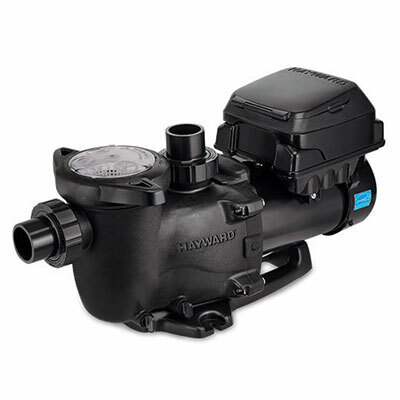 Let's take a look at the best pool pumps from the most trusted pump manufactures in the world available conveniently online. 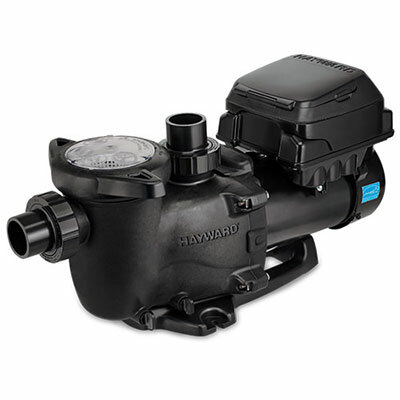 The Hayward TriStar Variable Speed Pool Pump is at the top of our list because it outperforms the competition in every way. It is arguably the most advanced pool pump in the world with incredible energy efficiency and a control system that allows for remote automation. Save money with up to 90% energy reductions and whisper quiet operation with its TEFC motor. The Pentair SuperFlo Variable Speed Pool Pump is a very close second on our list of top rated pool pumps for good reason. Aside from being from a world leader in water pumps, this Pentair water pump is packed with a tone of features at an affordable price. The energy savings are an industry best with an on board real time 24-hour programmable clock. The interface is easy to use and program as well as the option to use a 110 or 230VAC electrical connection. 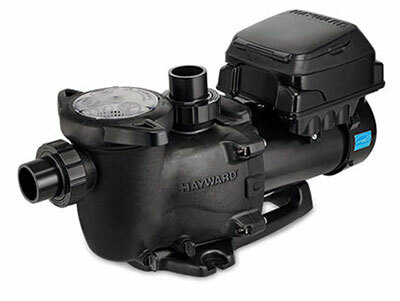 The Hayward MaxFlo Variable Speed Pool Pump delivers up to 80% energy cost savings compared to single speed pool pumps. 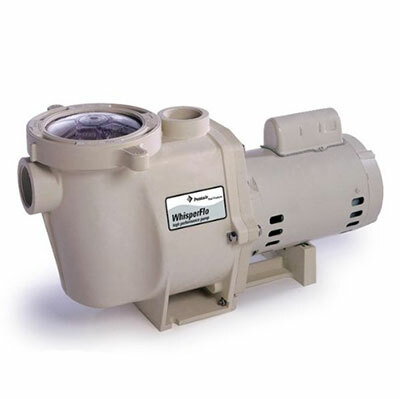 This unit is designed as a drop-in replacement to your existing MaxFlo pump and is available in both 115 and 230VAC for added installation convenience. This pump will pay for itself faster than other variable speed pumps on the market. The top rated dual speed pool pumps combine the affordability of a basic pump with the benefits up a 2 speed pool pump. They typically aren't as energy efficient or quiet as variable speed pumps but they have a lot of the great benefits including versatility and reliability. The Pentair SuperFlo Two Speed Pool Pump is your best choice for an extremely quiet energy star certified pump at a very affordable price. It can be configured for 1/2 HP to 2 1/2 HP operation to accommodate a wide range of pool applications. The see-through basket lid allows easy inspection of the strainer basket for low hassle cleaning. It's available in both 115 volt and 230 volt models. 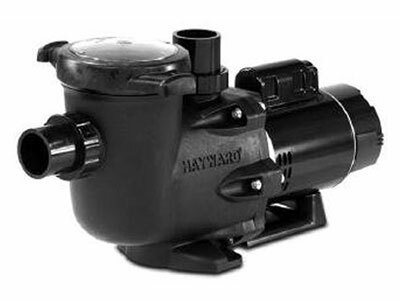 The Hayward 2 Speed Super Pool Pump is available in both dual and single speed models for added versatility. It can be used with most average sized inground pools with the option of 1.0, 1 1/2 and 2.0 HP motors. The see through basket lid makes it easy to maintain. 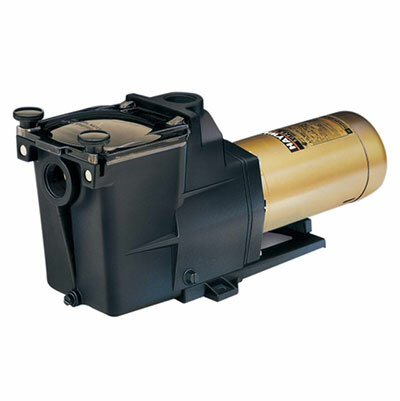 This dual speed high efficiency pump is reliable and quality built at a great price. The top rated single speed pool pumps make the list because they are affordable, durable and get the job done 24/7 every day of the year. A reliable pump is worth every penny and if you have basic requirements or need an above ground pool pump these will get the job done. They aren't as energy efficient as the advanced variable speed pumps but if you want a low upfront cost these pumps are where you should start. The Pentair SuperFlo Single Speed Pool Pump is a giant when it comes to single speed pumps. If you are looking for a simple and reliable pump for basic pool needs you really can't go wrong with this high performance pump. It features an oversized strainer basket for reduced maintenance times and a internal flow design for reduced hydraulic noise and efficient operation. 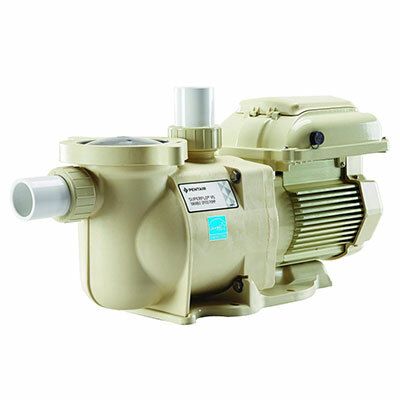 The Pentair WhisperFlo Single Speed Pool Pump is a high performance and energy efficient up-rated pump. The internal designed allows for reduced costs because it uses less horsepower to produce the required flow rate. The oversized strainer basket with see-through lid allow for easy maintenance. Overall this is a very reliable pump at a great price if you are looking for the option of choosing between a single and dual speed pump. Whether you are looking to purchase a new pump or you've owned a pool for years you may have some questions about pool pumps. Arming yourself with answers to questions will only enable you to make a better decision about your current pump or when you decide to replace or upgrade your existing pump. What is the yearly cost to operate a pump? The pool pump yearly cost average is between $150 - $350. It costs about $10 a month to operate a variable speed pool pump and $25 a month to operate a single speed pump assuming everything is equal. Since electricity costs fluctuate and vary by region you should only use these numbers as a rough guideline. If you have more pool features or operate your pump for longer run times it will cost slightly more due to increased electricity usage. 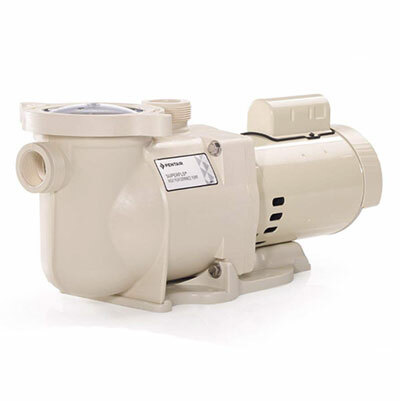 What are the electrical requirements for pool pumps? Pool pumps are powered by either 115 volts or 230 volts. It's common to find pumps that can be configured to operate on either power depending what is easier for the owner. If you are replacing a pump that operated on 115 volts it makes it a lot easier to replace it with a pump that runs on the same. It is not necessary but it will save a bit of time during installation. A typical home electrical outlet uses 115 volts and is the easiest type of installation. If your pump is hardwired and/or required an electrician to install it is most likely operating on 230 volts. If you are unsure we recommend using a multimeter to test your connection in addition to reading the specs on the pump itself. If you are not familiar with electrical connections hire a professional to install your pool pump. How do I apply for energy rebates for my variable speed pump? If you are replacing your old pump with a new variable speed pool pump you are most likely entitled to a consumer rebate. In an attempt to reward consumers for purchasing high efficiency products, government has partnered with major pump manufacturers to offer rebates. These rebates start at $50 - $100 and are definitely worth taking the time to apply for and generally only take a few minutes. How many hours a day should I run my pool pump? The average pool will require the pump to run 4 - 8 hours per day. This number is a very rough estimate and will change throughout the season depending on a number of factors. The ultimate goal is to achieve the recommended two complete turnovers per day which means you are cycling through the entire volume of your pool twice in a 24 hour period. Pool pump run times will vary depending on pool volume, pump size, piping and other variables. What distance from pool should I install the pump? A pool pump can be installed at any distance from the pool within reason. As you increase the piping distance between the pump and and pool you will be increasing the resistance to the flow rate and increasing the total dynamic head. This means that you will require more water pressure and a higher horsepower pump the further away from the pool you locate the pump. Do I need to winterize my pool pump? Yes it's important to winterize a pool pump if you live in areas that experience freezing temperatures. 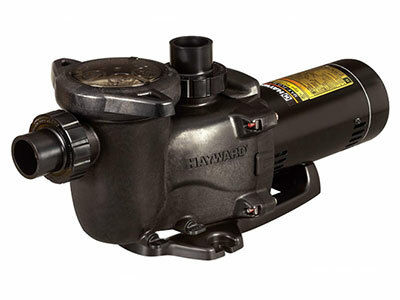 This ensures the pump isn't damaged when water freezes and expands inside the pump. You can extend the life of a pump be protecting it either with a simple pool pump motor cover or storing it inside a pool storage shed year round. Protecting it from the sun and wind while being well ventilated is key to prolonging the life of your pump. We've put together a short list of possible issues that a handy pool owner can troubleshoot on their own. If the issue requires a professional we recommend hiring someone that has expertise and knowledge working with pool pumps. In some cases you can void the warranty if you don't hire a certified professional to diagnose a problem with a pool pump. Ensure that the wires were installed correctly in correlation with the manufacturers wiring diagram. Check for a tripped circuit, blown fuse, open switches or relays and any loose wiring. A pool pump making a humming noise could mean the impeller is jammed with debris and needs to be opened up and serviced by a professional. Check for proper seals in the suction piping and other joints. The pump may have been improperly mounted. Make sure its securely fastened to a level surface or mounting pad. A leaky seal could lead to the bearings getting worn out by water and/or chemicals. This could lead to rust, overheating and needs to be greased or serviced. We hope you found this page all about pool pumps informative and you get to enjoy many years with your new pump. The time you spent learning about pumps will help you avoid headaches down the road. If you have any questions you can contact us and we will try to get back to you within 1-3 business days.